1. Place a large pot on the stove, rough chop the onions, pepper, and garlic. Add them to the pot along with 2 tablespoons of the oil. Cook over medium heat until these vegetables are soft. Add the blacken, and cook for another minute, or so, until you can smell the flavors of the blacken. 2. Add another 2 tablespoons of oil, and the flour. Stir the flour in well and let it cook for a bout 5 minutes to get the raw taste of flour out. You've just made a blonde roux. 3. While the roux is cooking, peel the squash, being carful to peel until you see the dark orange color. Cut it in half, then clean out the seed cavity. 4. Cut both the squash and apples into 1" chunks before adding it to the pot. 5. Slowly stir in the broth, then add the squash and apples. Let this simmer for about 30 minutes, or until the squash and apples are soft. 6. 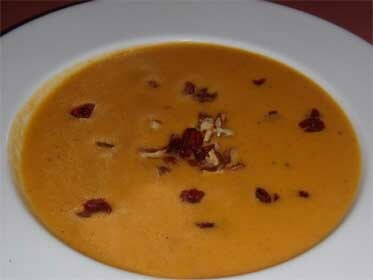 Puree' with an immersion blender, or place it in a counter type blender or food processor. Be real carefull blending this, 'cause it's real hot. 7. Place the soup back into the pot, and taste for salt and pepper. Add the cream, and you're ready to serve. 8. Serve hot with chopped craisins and pecans on top.